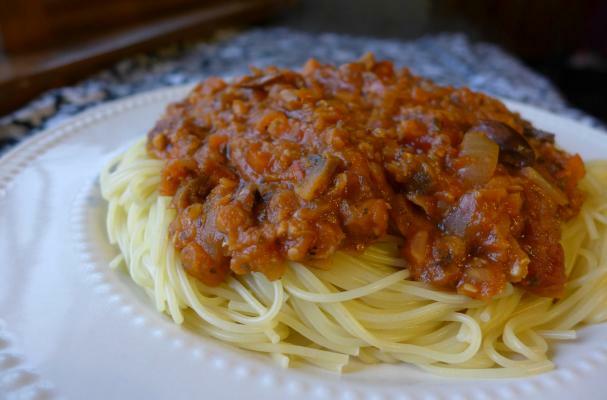 Vegan spaghetti bolognese is a favorite Italian dish that is free from any and all animal products. This tomato sauce is made a little differently and if you are from the old country, please keep an open mind. Tomatoes, onions and red bell pepper are roasted and then blended before they are tossed with the toasted tempeh and whole wheat spaghetti. Fresh basil and parsley add an herbaceous quality to the sauce and brightens the dish. Even though this vegan spaghetti bolognese is far from the traditional recipe, it is still delicious. Step 2: Toss the tomatoes, bell pepper, and onion with olive oil and salt and pepper. Wrap the head of garlic in foil and season with olive oil, salt and pepper. Place all vegetables onto a baking sheet and roast for 30 to 40 minutes until they are soft and begin to turn golden brown. Remove from oven and let cool. Remove the skins of the bell pepper and tomato. Step 3: Place a large pot of water on the stove to boil. When boiling, season generously with salt. Cook pasta according to package directions. Before draining, reserve a cup of pasta water. Step 4: Heat olive oil over medium high heat and add crumbled tempeh and tomato paste. Cook for 7 to 9 minutes.